Sometimes I just want a homemade muffin. It’s a fact. I find it goes hand-in-hand with wanting my apartment to smell like a bakery for the rest of the morning while I browse through cooking magazines and sip my Starbucks House Blend coffee. I woke up Saturday morning and wanted a muffin that was maybe just a little bit naughty (no matter how much dried fruit and flax you stuff in there, it’s still going to be a confection), but wasn’t a 500-calorie sugar bomb that would keep me full for all of five minutes. Some protein and fiber would be nice, too. 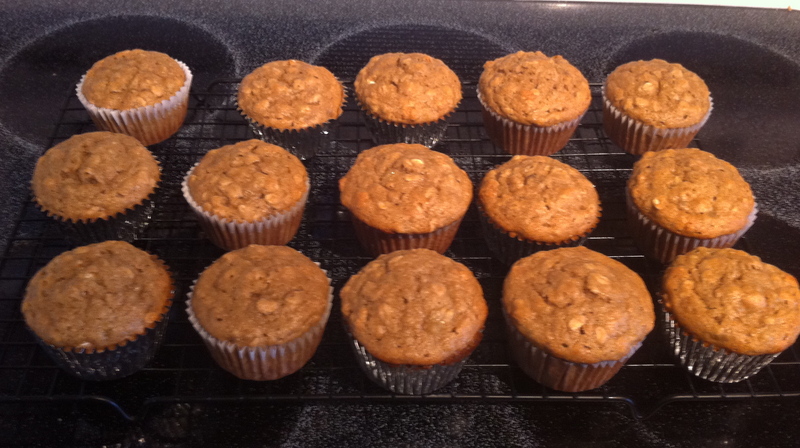 So I jumped on my favorite food blogs and soon enough found my winner: Peanut Butter Banana Oatmeal Muffins. There isn’t a word (or ingredient) in there that I don’t love. So I mashed. And I measured. And I mixed. And in less than 30 minutes, breakfast was served. I nibbled my muffin, sipped my coffee, leafed through my magazines, inhaled deeply and smiled. Sure enough, my apartment smelled like a bakery just like I hoped it would. Who could possibly wait for them to cool? Preheat the oven to 350˚ F. Line 18 muffin cups with paper liners. In a medium mixing bowl, combine the flour, oats, baking powder, baking soda and salt. Stir together to blend. 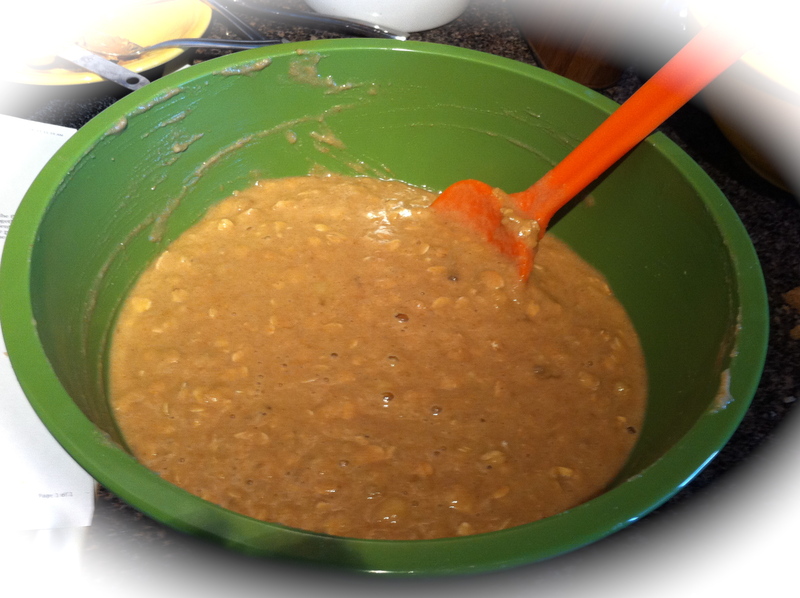 In a large mixing bowl, whisk together the applesauce, brown sugar, eggs, banana, peanut butter and buttermilk until smooth. Pour the dry ingredients into the bowl with the wet ingredients and mix just until incorporated and fully blended. Divide the batter between the prepared muffin cups. Bake 18-20 minutes, or until a toothpick inserted in the center comes out clean. Allow to cool in the pan 5-10 minutes, then transfer to a wire rack. 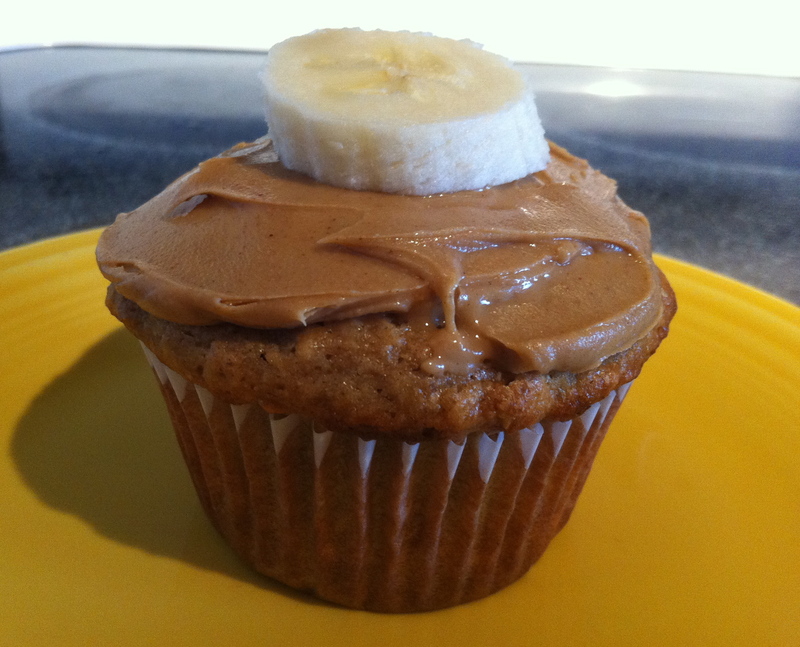 Top with peanut butter and banana slice. *Original recipe said 1 cup buttermilk, but I found low-fat milk worked just fine. This entry was posted in Baked goods on September 19, 2011 by Paige Greenfield.